Here, in chronological order, is a sampling of some of the most memorable films partly or wholly shot at Michigan locations. Some are Indies; some are major studio blockbusters, but all are famous players in American filmdom. In this road movie, Max (Gene Hackman), a brawling ex-con drifter hits the road in California with Lion (Al Pacino), a happy-go-lucky homeless ex-sailor, as they head east together. Lion is headed to Detroit to see the child born while he was at sea; Max, to Pittsburgh, where he intends to open a car wash. In Denver, they land in jail for a month, where Lion is nearly raped by an inmate who savagely traumatizes him. No longer the amusing scarecrow of the movie's title, Lion turns morose. Max becomes his protector, and in Detroit, when the vindictive mother of Lion's child lies that the child died at birth and will have no soul, Lion is at first manic then falls into catatonia. Max helps him to a psychiatric hospital, where he vows he will return to help. The film was co-winner of the Grand Prix at the 1973 Cannes Film Festival. This film is a romance starring Christopher Reeve, who plays a Chicago playwright experimenting with a discovery that he can use self-hypnosis to travel back in time. He lands in the early 1900s at the luxurious Grand Hotel on Michigan's Mackinac Island. There, he meets beautiful stage actress Jane Seymour, and they fall in love. But their star-crossed paths don't meet for long. He dies in the past of an apparent broken heart; she lives on, still searching for him. The movie was nominated for an Oscar. 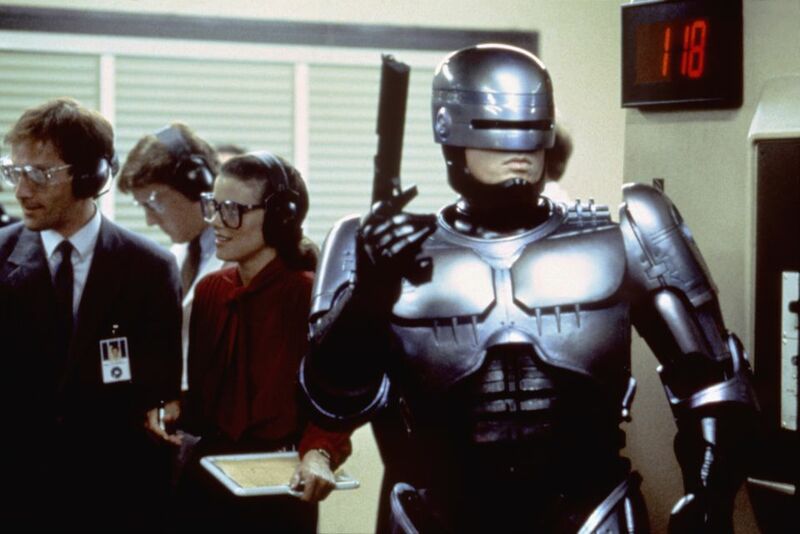 In a futuristic, dystopian ​Detroit, a mortally wounded cop played by Peter Weller returns to the force as a powerful part-human, part-robot cop haunted by hazy memories of a family. This cyborg, unveiled as Robocop, becomes the force's most successful crime fighter and the target of Detroit's super villains. This Oscar-nominated film was directed by the great Paul Verhoeven. This weird buddy movie stars Robert De Niro as a bounty hunter who locates a former Mafia accountant who jumps bail, played by Charles Grodin. De Niro must transport Grodin from New York to L.A. in order to pocket a fat fee. But the trip is made difficult by the Mafia, a competitor and the FBI, and the two form a kind of friendship along the way. The movie was nominated for two Golden Globes. A thriller based on an acclaimed Elmore Leonard novel, this movie stars George Clooney as a career bank robber who breaks out of jail and heads to Detroit with a buddy (Ving Rhames) to carry out a final scam. A US Marshal, played by ​Jennifer Lopez, is on their case but finds she's attracted to Clooney's character and has second thoughts about bringing them in. The Oscar-nominated film was directed by the great Steven Soderbergh. This is a semi-autobiographical film starring Eminem. He plays a young rapper based on his own struggles with poverty, violence and an alcoholic mother (Kim Basinger) to make it big. Surviving in the crime-infested ghettos of 8 Mile Road, which runs along the northern boundary of Detroit, the rapper has an opportunity to show his extraordinary natural talent at rapping, and he takes it. This Oscar-winning film was directed by the great Curtis Hanson. This Motown musical, which originated on Broadway, stars a dream team of musical stars from Jennifer Hudson to Beyoncé and A-listers like Jamie Foxx and Eddie Murphy. It loosely chronicles the rise of the Motown sound, its founder Berry Gordy and the famous girl groups like the Marvelettes and the Supremes who helped forge Motown Records' star-filled future. Foxx plays the founder, and Murphy is a 1960s R&B performer who uses Foxx's Dreamettes girl group as a backup. The girls soon outperform him and get their own act, in the process crossing over from soul to the pop charts. Hudson's character, a full-throated big girl, is treated badly and quits the group, opening the way for Foxx to take the girls to the mainstream top. This Oscar winner was directed by the great Bill Condon. In this social drama, disgruntled Korean War veteran Walt Kowalski, played by Clint Eastwood, is a tough, prejudiced old man who can't stomach the changes in his Michigan neighborhood. He sets out to reform his neighbor Thao, who tries to steal Kowalski's prized possession, a 1972 Gran Torino, under gang pressure. The old man is drawn into the life of the boy's family, who are proud Hmong people from the mountains of Asia, and conjures ways to protect them from the plague of gangs in the area. The great Clint Eastwood also directed this Golden Globe-nominated film. In this dark drama, Ben Affleck, as a power-phobic Batman, is pitted against Man of Steel Henry Cavill. Future Batman fears that Superman has been left unchecked, and the citizens of Gotham are beginning to be concerned about his presence on Earth. Batman takes him on while criminal mastermind Lex Luthor makes his own attempt at containing Superman. Meanwhile, the world struggles with deciding which superhero it really needs. The Transformers franchise of science fiction action films has been good to Michigan, where portions of the 2007 first film, the 2011 third film, the 2014 fourth film, and the 2017 fifth film have been shot. It has cut a wide swath through Michigan film locations since 2006 when shooting was carried out for "Transformers," the first film in the series. Franchise director Michael Bay took on a number of locations but nearly always came back to Michigan for these very profitable big-budget films that are dense with action sequence after action sequence. It's an incredible achievement for a franchise that's based on a toy line by Hasbro.